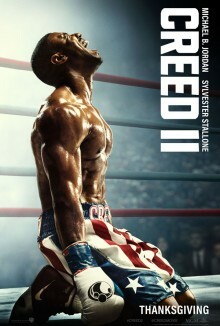 Join LatinoScoop at an exclusive advance screening of CREED II in select locations below. Click on the city name below for your city and enter the code. If you download a screening pass and aren’t able to use it, please share it with someone who can attend. There is a limited number of passes available for each location. Screening passes are available on a first-come, first-serve basis. Additional passes will not be added once they are all redeemed. Anyone downloading a screening pass is advised to arrive early to secure seating. The theater is intentionally overbooked by the studio to ensure a full house. Plan accordingly to arrive at the theater with enough time. Send an email to screenings@latinoscoop.com for a chance to win a screening pass for two. LatinoScoop will randomly select a few winners for the Houston screening.